In many ways the end of the Vietnam War left the US army a spent force. Plagued by low morale, drug and race issues, and terrible public relations, the army faced an uphill climb in the effort to rebuild itself. The story of this reconstruction is mirrored in the rise of the Mechanized Infantryman. Deciding that the key to future conflict lay in highly trained and mobile warriors that could be delivered quickly to battle, the army adopted the mechanized infantryman as its frontline troops. This new, all volunteer force was given the best training and equipment. Most notably, they were to be deployed onto the battlefield from the new M2 Bradley Armoured Fighting Vehicle. This new breed of American warriors got their first test in the First Gulf War. Fighting in the deserts of Kuwait and Iraq, these soldiers proved that the US Army was once again a force with which to be reckoned. 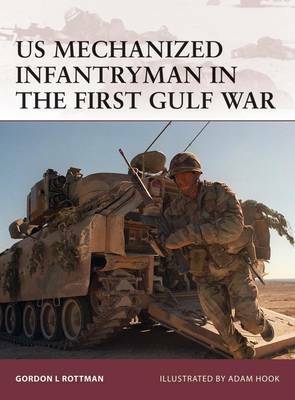 This book tells the story of the rise of the US mechanised infantryman, focusing on his recruitment, training, lifestyle and combat experiences in Iraq.